This past week has been one of the most exhilarating, entertaining and rewarding experiences of my life. 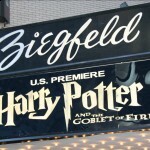 It took months of email exchange, phone calls, waiting…more waiting and a bit of darn good luck, but I, along with Zach and Catherine, were able to secure tickets to the premiere of Harry Potter and the Goblet of Fire in New York City, to be held at the Ziegfeld Theatre on November 12. I’ll start my report on Wednesday, November 9, the day my journey began. We (being a groggy and tired Andy, and his dad) left Canberra in the early hours of the morning, and flew to Sydney International Airport. We had a few hours of stopover in Sydney, where I planned the days ahead out in my head, over and over again. This would be my third international flight, and my second to the United States. The flight went as good as could be expected, and I arrived – before I had even left – (ahh…time zones!) in Los Angeles, just as excited, albeit tired. We caught our connecting flight, and arrived in New York that afternoon. After a long taxi ride, and half an hour of navigating the Third Task – err – Manhattan streets, we arrived at our hotel, checked in, and crashed. Thursday and Friday were spent sightseeing, planning questions, and stressing about the logistics of the premiere. We had printed literally 1,500 Harry Potter Fan Zone flyers to give out, and had HPFZ name badges made up. On Friday night, Zach, Catherine and myself attended a Harry Potter themed dinner at the Jekyll and Hyde Club, hosted by Jeannie Barresi of Beyond Boundaries Travel, who is also the coordinator of the HP Fan Trips. I also met a number of fellow Potter fans for the first time that night, including Jeff and Geri from HPANA, Jenna from DanRadcliffe.com and the HP Fan Trip crew. The latter half of Friday night was spent preparing any final questions for the day ahead. Zach and I awoke early the next morning, set up our camera and microphone (tested it, numerous times! 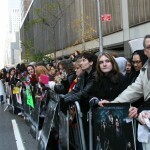 ), prepared the flyers, dressed in our premiere attire, and headed down to the Ziegfeld. The crowd was absolutely amazing. A group of fans, spread further than the eye could see, lined the streets of Manhattan, and cheered every time a camera was hoisted into the air. We got some great footage of the fans, including interviews with some very dedicated and loyal Potter heads like ourselves. We talked to a number of HPFZ fans, and gave out flyers to the screaming girls fans who ate them up like Butterbeer. We made our way over to the red carpet, and I met a number of fellow friends from the website community, including a very good friend of mine, Daniel from The Quidditch Pitch (now offline). I also had the pleasure of meeting Andrew, Ben and Emerson of MuggleNet and Sue of The Leaky Cauldron. We checked into the press area at 2 PM, where we were ushered to an area on the red carpet, and given press stickers to display. Catherine made her way to the photographer’s pit, as she was covering photography for the event. The red carpet was lined with Harry Potter posters, and was opposite the cheering fan base, who were still bellowing remarks such as, “close the road!” and “Daniel…Daniel…Daniel!”. All in all, it was an amazing atmosphere. 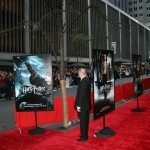 The first star to walk the red carpet was Jamie Waylett (Vincent Crabbe). I asked him if he thought, under the surface, Crabbe was really a “big, bad guy”. He replied, “nah…I think he’s a little softie, I really do”. I talked to Tolga Safer next, the actor who play Karkaroff’s Aide. I asked him what he thought made this film so different from any other project he had worked on. He commented on the scale of it, and the massive fan base which supported it. 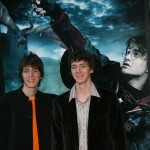 I had the pleasure of talking to the Weasley twins (James and Oliver Phelps) next. I asked them what it was like to film the scene with the age line and the Goblet of Fire, and the process they went through in choosing a beard. They commented on the number of different wigs and beards they were able to try on, how they sequenced the scene, and how fun it was, “having an onscreen fight with your brother”. Daniel and Emma both came by, and I only had time to shove in a quick, “hello, I’m Andy from Ha….”, before they were ushered into the cinema. Unfortunately, Rupert avoided the majority of media and went over to sign autographs for the fans instead. At this point, the rest of the cast were ushered into the cinema, and the media sent to disperse. Zach, Catherine and myself were able to secure tickets to the film (thanks to Darren of Warner Bros.! ), so without hesitation, we made our way into the cinema. Zach and I found our seats (back row – perfect height) and the cast made their way on stage. Alan Horn, CEO of Time Warner came on stage, and invited the cast and crew up. 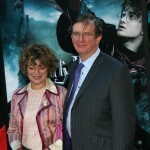 Mike Newell and David Heyman commented on the film, and apologized for Jo Rowling’s absence (her husband was unwell) and then took their seats, along with the other cast members. The curtains opened, the cinema went dark, and the Warner Bros. logo appeared on screen, the Goblet of Fire soundtrack (“The Story Continues”) accompanying it. As the final credits rolled on by, the majority of invited guests left the cinema. Zach and I made sure to stay until the very end. All in all, the film was amazing, and it was by far, my favourite of the series. Mike Newell has done all Potter fans proud – it’s the perfect blend of adventure and emotion. After collecting our media equipment, we made our way down to the lobby, where we were able to gain autographs, and have a quick chat to Jamie Waylett (Vincent Crabbe), Jason Isaacs (Lucius Malfoy), Robert Pattinson (Cedric Diggory) and Matthew Lewis (Neville Longbottom). We made our way out of the cinema, talked to a few fans, who were eager to hear about the film, and headed off to have dinner – an amazing day under our belts. Sadly, my flight left the next morning. I’d like to personally thank everyone who made this event possible, particularly Orna Zadeh, Darren Olcsvary and Adam from Warner Bros. My fellow and wonderful staffers Zach McCleary and Catherine Collins, my extremely supportive dad, who kindly agreed to travel with me, Eric Scull, a great friend from MuggleNet, the amazingly charming, friendly and HP-knowledgeable Courtney Gras and all the amazing friends I met from the HP Fan Trips, Jeannie Barresi from Beyond Boundaries Travel, and all the fellow web folk who I met along the way. What a community we makeup. Without a doubt, this is only the beginning of my HP-related adventures.